Definition at line 44 of file llfocusmgr.h. Definition at line 111 of file llfocusmgr.h. Definition at line 47 of file llfocusmgr.h. Definition at line 42 of file llfocusmgr.cpp. Definition at line 61 of file llfocusmgr.cpp. Definition at line 168 of file llfocusmgr.cpp. References FALSE, LLView::getParent(), mKeyboardFocus, and TRUE. Referenced by LLFloaterView::bringToFront(), LLViewerWindow::childHasKeyboardFocus(), LLView::childHasKeyboardFocus(), commit_select_component(), LLFolderView::doIdle(), LLBottomPanel::draw(), LLFloaterTexturePicker::draw(), LLScrollableContainerView::draw(), LLRadioGroup::draw(), LLPanel::draw(), LLOverlayBar::draw(), LLModalDialog::draw(), LLFloaterColorPicker::draw(), LLFloater::draw(), LLNotifyBox::drawBackground(), LLView::focusNext(), LLView::focusPrev(), LLPanelVolume::getState(), LLPanelObject::getState(), handle_chat(), LLViewerWindow::handleKey(), LLPanel::handleKey(), LLTabContainerVertical::handleKeyHere(), LLTabContainer::handleKeyHere(), LLPanel::handleKeyHere(), LLFloaterIMPanel::handleKeyHere(), LLFolderView::handleKeyHere(), LLComboBox::handleKeyHere(), LLFloaterColorPicker::handleMouseDown(), LLFolderView::handleUnicodeCharHere(), LLComboBox::handleUnicodeCharHere(), LLUICtrl::hasFocus(), LLFloaterView::highlightFocusedFloater(), LLInventoryView::incrementalFind(), LLModalDialog::onAppFocusLost(), LLFloater::releaseFocus(), releaseFocusIfNeeded(), LLTabContainerCommon::removeTabPanel(), LLFolderView::scrollToShowItem(), LLUICtrl::setFocus(), LLPanel::setFocus(), LLFloater::setFocus(), LLChatBar::setKeyboardFocus(), LLFloaterColorPicker::setMouseDownInHueRegion(), LLFloaterColorPicker::setMouseDownInLumRegion(), LLFloaterColorPicker::setMouseDownInSwatch(), LLDebugVarMessageBox::show(), LLFloaterView::syncFloaterTabOrder(), LLPanelInventory::updateInventory(), and LLModalDialog::~LLModalDialog(). Definition at line 183 of file llfocusmgr.cpp. References FALSE, LLMouseHandler::isView(), mMouseCaptor, and TRUE. Referenced by LLFloaterTexturePicker::draw(), LLModalDialog::draw(), LLFloaterColorPicker::draw(), LLModalDialog::onAppFocusLost(), LLFloater::releaseFocus(), releaseFocusIfNeeded(), LLFolderView::scrollToShowItem(), and LLFloater::setVisible(). Definition at line 277 of file llfocusmgr.cpp. References FALSE, mTopCtrl, and TRUE. Referenced by LLFloater::releaseFocus(), releaseFocusIfNeeded(), and LLFloater::setVisible(). Definition at line 380 of file llfocusmgr.cpp. Definition at line 89 of file llfocusmgr.h. Referenced by main_loop(), and process_keystrokes_async(). Definition at line 68 of file llfocusmgr.h. Referenced by LLFloaterLagMeter::determineClient(), display(), LLButton::draw(), main_loop(), and update_statistics(). Definition at line 76 of file llfocusmgr.h. Definition at line 63 of file llfocusmgr.h. Referenced by handle_grab_texture(), open_offer(), and LLNewAgentInventoryResponder::uploadComplete(). Definition at line 334 of file llfocusmgr.cpp. References getFocusFlashAmt(), lerp(), mAppHasFocus, LLColor4::mV, LLUI::sColorsGroup, VALPHA, and LLColor4::white. Referenced by LLSlider::draw(), LLScrollbar::draw(), LLButton::draw(), LLViewBorder::drawOnePixelLines(), and LLViewBorder::drawTwoPixelLines(). Definition at line 329 of file llfocusmgr.cpp. References clamp_rescale(), f, FOCUS_FADE_TIME, getFocusTime(), and mFocusWeight. Referenced by LLSlider::draw(), LLButton::draw(), LLViewBorder::drawOnePixelLines(), and getFocusColor(). Definition at line 64 of file llfocusmgr.h. Definition at line 60 of file llfocusmgr.h. Referenced by LLViewerWindow::changeDisplaySettings(), LLFloater::closeFocusedFloater(), LLView::draw(), LLTextEditor::draw(), LLScrollListCtrl::draw(), LLScrollbar::draw(), LLPanel::draw(), LLLineEditor::draw(), LLFolderViewItem::draw(), LLPanelEditWearable::draw(), LLFloater::draw(), LLTextEditor::drawBackground(), LLTextEditor::drawCursor(), LLViewerWindow::getKeyboardFocus(), handle_dump_focus(), handle_grab_texture(), LLViewerWindow::handleKey(), LLPanel::handleKey(), LLTextEditor::handleKeyHere(), LLPanel::handleKeyHere(), LLLineEditor::handleKeyHere(), LLLineEditor::handleMouseDown(), LLViewerWindow::handlePerFrameHover(), LLViewerWindow::handleUnicodeChar(), LLTextEditor::handleUnicodeCharHere(), LLLineEditor::handleUnicodeCharHere(), LLViewerWindow::hasKeyboardFocus(), LLFloaterPreference::onBtnApply(), LLFloaterPreference::onBtnCancel(), LLFloaterPreference::onBtnOK(), open_offer(), LLPanelPermissions::refresh(), LLVoiceHotkeySelectDialog::setFocus(), LLPanel::setFocus(), LLPanelLogin::show(), LLNewAgentInventoryResponder::uploadComplete(), and LLView::~LLView(). Definition at line 366 of file llfocusmgr.cpp. References LLView::getViewByHandle(), mFocusHistory, LLView::mViewHandle, and NULL. Definition at line 54 of file llfocusmgr.h. Referenced by LLFolderView::doIdle(), LLScrollbar::draw(), LLViewerWindow::getMouseCaptor(), LLViewerWindow::handleDoubleClick(), LLButton::handleHover(), LLViewerWindow::handleMouseDown(), LLViewerWindow::handleMouseLeave(), LLViewerWindow::handleMouseMove(), LLViewerWindow::handleMouseUp(), LLViewerWindow::handlePerFrameHover(), LLViewerWindow::handleRightMouseDown(), LLViewerWindow::handleRightMouseUp(), LLViewerWindow::handleScrollWheel(), LLView::hasMouseCapture(), and LLTool::hasMouseCapture(). Definition at line 81 of file llfocusmgr.h. Referenced by LLViewerWindow::draw(), LLModalDialog::draw(), LLViewerWindow::getTopCtrl(), LLViewerWindow::handleDoubleClick(), LLViewerWindow::handleKey(), LLViewerWindow::handleMouseDown(), LLViewerWindow::handleMouseUp(), LLViewerWindow::handlePerFrameHover(), LLViewerWindow::handleRightMouseDown(), LLViewerWindow::handleRightMouseUp(), LLViewerWindow::handleScrollWheel(), LLViewerWindow::handleUnicodeChar(), LLViewerWindow::hasTopCtrl(), LLComboBox::hideList(), LLView::setVisible(), and LLUICtrl::~LLUICtrl(). Definition at line 317 of file llfocusmgr.cpp. References mKeyboardFocus, mKeyboardFocusLostCallback, mKeyboardLockedFocusLostCallback, and mLockedView. Definition at line 66 of file llfocusmgr.cpp. References childHasKeyboardFocus(), childHasMouseCapture(), childIsTopCtrl(), mKeyboardLockedFocusLostCallback, mLockedView, NULL, setKeyboardFocus(), setMouseCapture(), and setTopCtrl(). Referenced by LLViewerWindow::handlePerFrameHover(), LLModalDialog::setVisible(), LLModalDialog::stopModal(), LLFloaterAvatarPicker::~LLFloaterAvatarPicker(), LLFloaterNameDesc::~LLFloaterNameDesc(), LLFolderView::~LLFolderView(), LLFolderViewFolder::~LLFolderViewFolder(), LLLineEditor::~LLLineEditor(), LLPreview::~LLPreview(), LLProgressView::~LLProgressView(), LLTextEditor::~LLTextEditor(), LLUICtrl::~LLUICtrl(), and LLUploadDialog::~LLUploadDialog(). Definition at line 200 of file llfocusmgr.cpp. References mKeyboardFocus, mKeyboardFocusLostCallback, mKeyboardLockedFocusLostCallback, mLockedView, and NULL. Referenced by LLVoiceHotkeySelectDialog::setFocus(), and LLView::~LLView(). Definition at line 261 of file llfocusmgr.cpp. Referenced by LLTool::~LLTool(), and LLView::~LLView(). Definition at line 306 of file llfocusmgr.cpp. Referenced by LLProgressView::draw(), and LLUICtrl::~LLUICtrl(). Definition at line 351 of file llfocusmgr.cpp. References FALSE, LLUICtrl::hasFocus(), mAppHasFocus, mTopCtrl, LLUICtrl::setFocus(), and triggerFocusFlash(). 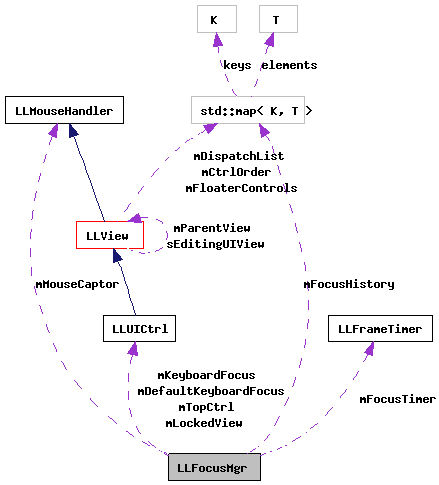 Referenced by LLViewerWindow::handleFocus(), and LLViewerWindow::handleFocusLost(). Definition at line 162 of file llfocusmgr.cpp. Referenced by LLPanelLogin::close(), LLPanelLogin::LLPanelLogin(), and LLPanelLogin::show(). Definition at line 94 of file llfocusmgr.cpp. References LLView::getName(), LLView::getParent(), LLView::hasAncestor(), LLView::isFocusRoot(), lockFocus(), mDefaultKeyboardFocus, mFocusHistory, mFocusTimer, mFocusWeight, mKeyboardFocus, mKeyboardFocusLostCallback, mLockedView, LLView::mViewHandle, NULL, LLFrameTimer::reset(), LLViewHandle::sDeadHandle, LLUICtrl::setFocus(), and TRUE. Referenced by LLViewerWindow::changeDisplaySettings(), commit_select_component(), LLAgent::endAnimationUpdateUI(), LLPanelVolume::getState(), LLPanelObject::getState(), handle_grab_texture(), LLAttachObject::handleEvent(), LLPanel::handleKeyHere(), LLFloaterIMPanel::handleKeyHere(), LLViewerWindow::handleMouseDown(), LLTabContainerVertical::handleMouseDown(), LLTabContainer::handleMouseDown(), LLViewerWindow::handleRightMouseDown(), idle_startup(), LLModalDialog::onAppFocusLost(), LLPanelFace::onClickApply(), LLPanelLandMedia::onClickStartMedia(), LLPanelGroupVoting::impl::onClickSubmitProposal(), LLComboBox::onItemSelected(), open_offer(), LLObjectBridge::performAction(), LLFloater::releaseFocus(), releaseFocusIfNeeded(), LLUICtrl::setFocus(), LLPanel::setFocus(), LLViewerWindow::setKeyboardFocus(), and LLNewAgentInventoryResponder::uploadComplete(). Definition at line 221 of file llfocusmgr.cpp. References LLMouseHandler::getName(), mMouseCaptor, and LLMouseHandler::onMouseCaptureLost(). Referenced by LLModalDialog::draw(), LLViewerWindow::handleFocusLost(), LLPieMenu::handleHover(), LLWorldMapView::handleMouseDown(), LLViewerTextEditor::handleMouseDown(), LLTextEditor::handleMouseDown(), LLTextBox::handleMouseDown(), LLTabContainerVertical::handleMouseDown(), LLTabContainer::handleMouseDown(), LLSlider::handleMouseDown(), LLScrollListCtrl::handleMouseDown(), LLScrollbar::handleMouseDown(), LLResizeHandle::handleMouseDown(), LLResizeBar::handleMouseDown(), LLPreview::handleMouseDown(), LLLineEditor::handleMouseDown(), LLDragHandle::handleMouseDown(), LLButton::handleMouseDown(), LLWorldMapView::handleMouseUp(), LLViewerTextEditor::handleMouseUp(), LLTextEditor::handleMouseUp(), LLTextBox::handleMouseUp(), LLTabContainerVertical::handleMouseUp(), LLTabContainer::handleMouseUp(), LLSlider::handleMouseUp(), LLScrollListCtrl::handleMouseUp(), LLScrollbar::handleMouseUp(), LLResizeHandle::handleMouseUp(), LLResizeBar::handleMouseUp(), LLPreview::handleMouseUp(), LLLineEditor::handleMouseUp(), LLDragHandle::handleMouseUp(), LLButton::handleMouseUp(), LLPieMenu::handleRightMouseDown(), LLPieMenu::handleRightMouseUp(), LLPieMenu::hide(), LLModalDialog::onAppFocusGained(), LLModalDialog::onAppFocusLost(), LLScrollListCtrl::onFocusLost(), LLFloater::releaseFocus(), releaseFocusIfNeeded(), LLViewerWindow::setMouseCapture(), LLModalDialog::setVisible(), LLFloater::setVisible(), LLPieMenu::show(), LLComboBox::showList(), LLModalDialog::startModal(), and LLButton::~LLButton(). Definition at line 294 of file llfocusmgr.cpp. Referenced by LLModalDialog::draw(), LLComboBox::hideList(), LLModalDialog::onAppFocusGained(), LLFloater::releaseFocus(), releaseFocusIfNeeded(), LLViewerWindow::setTopCtrl(), LLView::setVisible(), LLProgressView::setVisible(), LLModalDialog::setVisible(), LLFloater::setVisible(), LLComboBox::showList(), and LLModalDialog::startModal(). Definition at line 345 of file llfocusmgr.cpp. References mFocusTimer, mFocusWeight, and LLFrameTimer::reset(). Referenced by LLNotifyBox::close(), LLView::focusFirstItem(), LLUICtrl::focusFirstItem(), LLView::focusLastItem(), LLView::focusNext(), LLView::focusPrev(), LLPanelGroupRolesSubTab::handleCreateRole(), LLNotifyBox::moveToBack(), setAppHasFocus(), and LLFloaterWorldMap::show(). Definition at line 323 of file llfocusmgr.cpp. References mKeyboardLockedFocusLostCallback, mLockedView, and NULL. Referenced by LLModalDialog::stopModal(), and LLModalDialog::~LLModalDialog(). Definition at line 109 of file llfocusmgr.h. Referenced by getAppHasFocus(), getFocusColor(), and setAppHasFocus(). Definition at line 100 of file llfocusmgr.h. Referenced by getDefaultKeyboardFocus(), setDefaultKeyboardFocus(), and setKeyboardFocus(). Definition at line 112 of file llfocusmgr.h. Referenced by clearLastFocusForGroup(), getLastFocusForGroup(), setKeyboardFocus(), and ~LLFocusMgr(). Definition at line 106 of file llfocusmgr.h. Referenced by getFocusTime(), setKeyboardFocus(), and triggerFocusFlash(). Definition at line 107 of file llfocusmgr.h. Referenced by getFocusFlashAmt(), setKeyboardFocus(), and triggerFocusFlash(). Definition at line 99 of file llfocusmgr.h. Referenced by childHasKeyboardFocus(), getKeyboardFocus(), lockFocus(), removeKeyboardFocusWithoutCallback(), and setKeyboardFocus(). Definition at line 101 of file llfocusmgr.h. Referenced by getFocusCallback(), lockFocus(), removeKeyboardFocusWithoutCallback(), and setKeyboardFocus(). Definition at line 93 of file llfocusmgr.h. Referenced by lockFocus(), releaseFocusIfNeeded(), removeKeyboardFocusWithoutCallback(), and unlockFocus(). Definition at line 92 of file llfocusmgr.h. Referenced by focusLocked(), lockFocus(), releaseFocusIfNeeded(), removeKeyboardFocusWithoutCallback(), setKeyboardFocus(), and unlockFocus(). Definition at line 96 of file llfocusmgr.h. Referenced by childHasMouseCapture(), getMouseCapture(), removeMouseCaptureWithoutCallback(), and setMouseCapture(). Definition at line 104 of file llfocusmgr.h. Referenced by childIsTopCtrl(), getTopCtrl(), removeTopCtrlWithoutCallback(), setAppHasFocus(), and setTopCtrl().